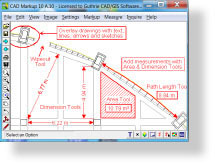 All Products - Guthrie CAD::GIS Software Pty Ltd.
Converts ArcView/ESRI shapefiles to AutoCAD® DXF and DWG formats. It allows shapefiles to be read by CAD software, such as AutoCAD, Bricscad, MicroStation, Visio, just to name a few. 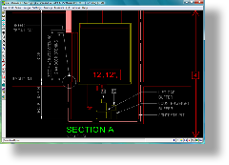 AutoCAD drawings viewer with an intuitive user interface that anyone can use. View, print, save to PDF, raster. Read all DXF and DWG drawings up to the latest AutoCAD 2019 release. Read HPGL, Esri shapefile, raster, and PDF drawings. Overlay drawings with auto-numbered balloons embedded with data & attributes. Pickup dimension values from CAD drawings. Export data to CSV/spreadheet. Built in tolerance tables. Allows you to revise drawings and add auto-numbered stamps with the minimum of fuss. 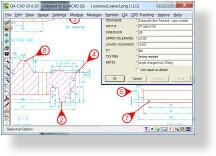 The software has been designed as a Lite version of QA-CAD. Converts all DWG, DXF and DWF drawings (up to AutoCAD 2019) and PDF. HPGL and HP-GL/2 .plt files to DXF/DWG converter. 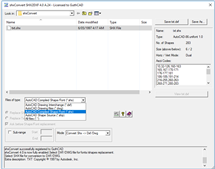 Outputs all DXF and DWG versions up to AutoCAD 2019. This softwar converts individual .SHX files to equivalent DXF format files.